Published on Friday, August 12, 2011. The jurors and Amundsen with winner Morgan Madison. The Awards of Excellence Walking Tour is - hands down - my favorite part of every ACC Show. Everyone gathers at the Council booth, and off we go to surprise the winning artists. 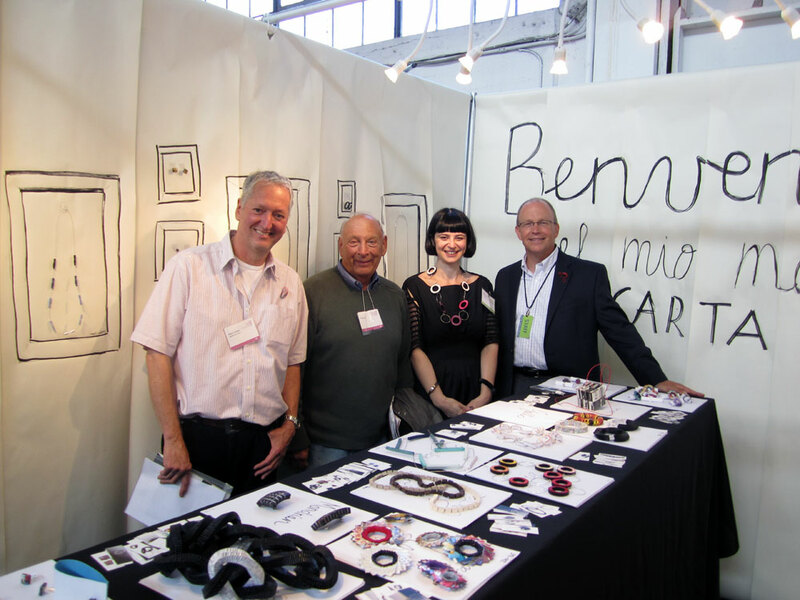 This year's San Francisco jurors were Mike Holmes, co-owner of Velvet da Vinci, and Ted Cohen, an exhibition designer who works with institutions such as the Museum of Craft and Design and the Museum of Craft and Folk Art. 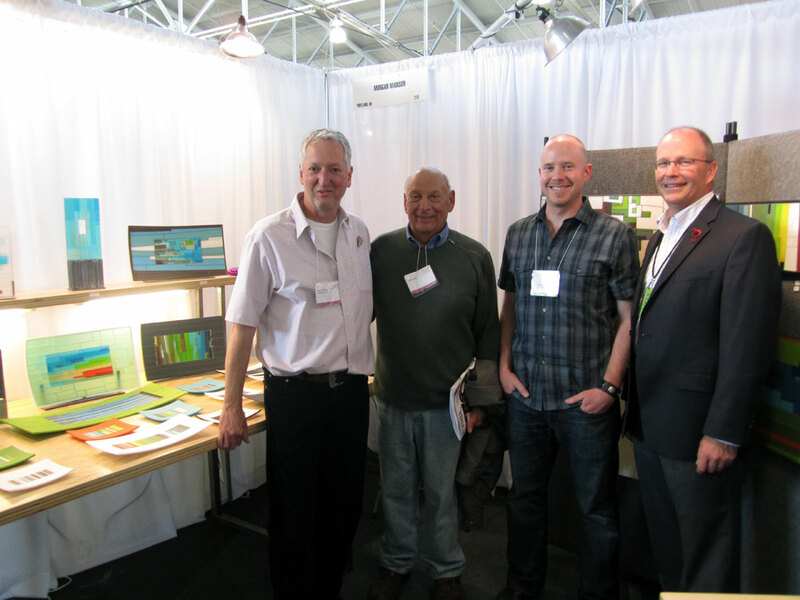 It was a supreme treat to listen to these veterans of the studio craft world as they bestowed four awards of excellence. Kinghorn's jewelry is a "glorious combination of spectacular workmanship and beautiful design," Holmes said. "The more you look at [her pieces], the more you realize what goes into them." The men praised Kinghorn's immaculate technique and the timeless quality of her quiet, thoughtful jewelry. Madison's kiln-formed and cold-worked glass compositions caught the jurors' attention for revitalizing, even reinventing a technique they've seen often at shows - but never like this, they stressed. Beautiful design, flawless execution. Madison's work is "a breath of fresh air," Cohen said. "It has a wonderful, free look to it." Vitali's innovative paper jewelry clearly captured the jurors' affections. "One of trends [in jewelry] is including nontraditional materials," Holmes said - and Vitali does it superbly, taking a "humble material" and transforming it through "wonderful technique." Cohen additionally praised her "good, smart booth design," with its white paper walls. Aarons' creative use of a corner location earned the ceramic artist the award for booth design. "It goes with the quality of the work," Cohen said - high praise from the expert exhibition designer. Aarons placed walls on the outside edge of his booth's footprint, creating a booth that people walk around instead of into. One wall is white; the other is black, allowing him to show off a range of work to its advantage. "It almost feels like two spaces," Holmes says. 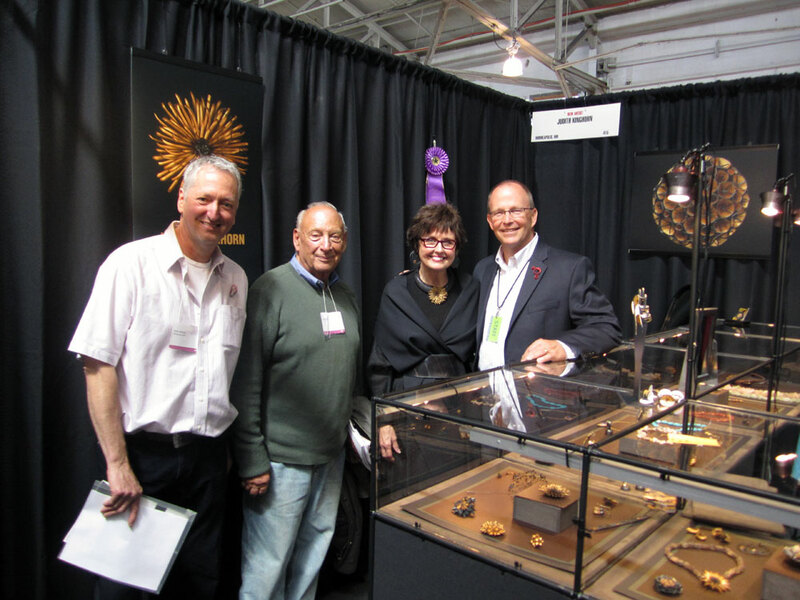 Jurors Mike Holmes and Ted Cohen, Judith Kinghorn, and ACC Executive Director Chris Amundsen. Francesca Vitali with the jurors and Chris Amundsen. 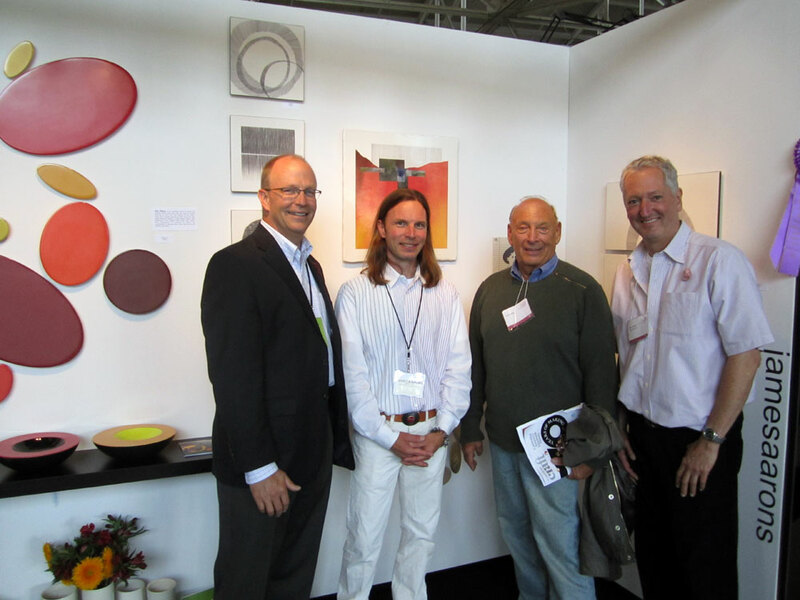 James Aarons with the jurors and Chris Amundsen on the white side of his booth.